We use simple rules to guide decision making every day. In fact, without them, we’d be paralyzed by the sheer mental brainpower required to sift through the complicated messiness of our world. You can think of them as heuristics. Like heuristics, most of the time they work yet some of the time they don’t. They work, the authors argue, because they do three things well. First, they confer the flexibility to pursue new opportunities while maintaining some consistency. Second, they can produce better decisions. When information is limited and time is short, simple rules make it fast and easy for people, organizations, and governments to make sound choices. They can even outperform complicated decision-making approaches in some situations. Finally, simple rules allow the members of a community to synchronize their activities with one another on the fly. First, they are limited to a handful. Capping the number of rules makes them easy to remember and maintains a focus on what matters most. Second, simple rules are tailored to the person or organization using them. College athletes and middle-aged dieters may both rely on simple rules to decide what to eat, but their rules will be very different. Third, simple rules apply to a well-defined activity or decision, such as prioritizing injured soldiers for medical care. Rules that cover multiple activities or choices end up as vague platitudes, such as “Do your best” and “Focus on customers.” Finally, simple rules provide clear guidance while conferring the latitude to exercise discretion. People often attempt to address complex problems with complex solutions. For example, governments tend to manage complexity by trying to anticipate every possible scenario that might arise, and then promulgate regulations to cover every case. Consider how central bankers responded to increased complexity in the global banking system. In 1988 bankers from around the world met in Basel, Switzerland, to agree on international banking regulations, and published a 30-page agreement (known as Basel I). Sixteen years later, the Basel II accord was an order of magnitude larger, at 347 pages, and Basel III was twice as long as its predecessor. When it comes to the sheer volume of regulations generated, the U.S. Congress makes the central bankers look like amateurs. The Glass-Steagall Act, a law passed during the Great Depression, which guided U.S. banking regulation for seven decades, totaled 37 pages. Its successor, Dodd-Frank, is expected to weigh in at over 30,000 pages when all supporting legislation is complete. Meeting complexity with complexity can create more confusion than it resolves. The policies governing U.S. income taxes totaled 3.8 million words as of 2010. Imagine a book that is seven times as long as War and Peace, but without any characters, plot points, or insight into the human condition. That book is the U.S. tax code. Applying complicated solutions to complex problems is an understandable approach, but flawed. The parts of a complex system can interact with one another in many different ways, which quickly overwhelms our ability to envision all possible outcomes. Complicated solutions can overwhelm people, thereby increasing the odds that they will stop following the rules. A study of personal income tax compliance in forty-five countries found that the complexity of the tax code was the single best predictor of whether citizens would dodge or pay their taxes. The complexity of the regulations mattered more than the highest marginal tax rate, average levels of education or income, how fair the tax system was perceived to be, and the level of government scrutiny of tax returns. Simple rules do not trump complicated ones all the time but they work more often than we think. Gerd Gigerenzer is a key contributor in this space. He thinks that simple rules can allow for better decision making. 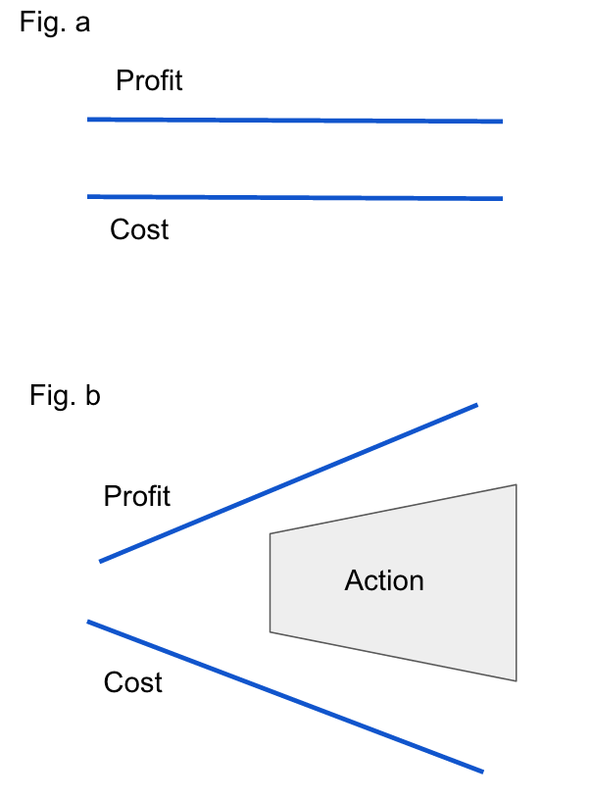 Why can simpler models outperform more complex ones? When underlying cause-and-effect relationships are poorly understood, decision makers often look for patterns in historical data under the assumption that past events are a good indicator of future trends. The obvious problem with this approach is that the future may be genuinely different from the past. But a second problem is subtler. Historical data includes not only useful signal, but also noise— happenstance correlations between variables that do not reveal an enduring cause-and-effect relationship. Fitting a model too closely to historical data hardwires error into the model, which is known as overfitting. The result is a precise prediction of the past that may tell us little about what the future holds. 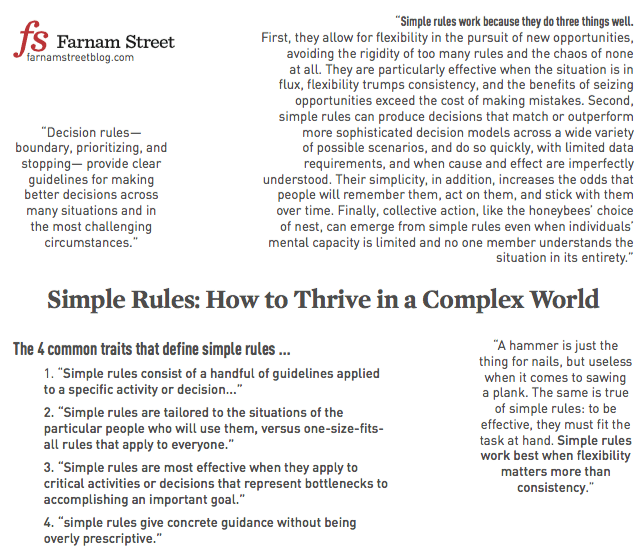 Simple rules focus on the critical variables that govern a situation and help you ignore the peripheral ones. Of course, in order to identify the key variables, you need to be operating in your circle of competence. When we pay too much attention to irrelevant or otherwise unimportant information, we fail to grasp the power of the most important ones and give them the weighting they deserve. Simple rules also make it more likely people will act on them. This is something Napoleon intuitively understood. When instructing his troops, Napoleon realized that complicated instructions were difficult to understand, explain, and execute. So, rather than complicated strategies he passed along simple ones, such as: Attack. The book mentions three types of rules that “improve decision making by structuring choices and centering on what to do (and what not to do): boundary, prioritizing, and stopping rules. Boundary rules guide the choice of what to do (and not do) without requiring a lot of time, analysis, or information. Boundary rules work well for categorical choices, like a judge’s yes-or-no decision on a defendant’s bail, and decisions requiring many potential opportunities to be screened quickly. These rules also come in handy when time, convenience, and cost matter. Prioritizing rules rank options to help decide which of multiple paths to pursue. Prioritizing rules can help you rank a group of alternatives competing for scarce money, time, or attention. … They are especially powerful when applied to a bottleneck, an activity or decision that keeps individuals or organizations from reaching their objectives. Bottlenecks represent pinch-points in companies, where the number of opportunities swamps available resources, and prioritizing rules can ensure that these resources are deployed where they can have the greatest impact. 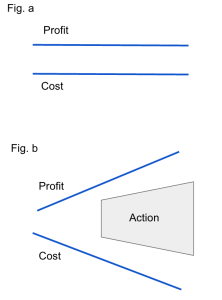 In business settings, prioritizing rules can be used to assign engineers to new-product-development projects, focus sales representatives on the most promising customers, and allocate advertising expenditure across multiple products, to name only a few possibilities. Stopping rules help you learn when to reverse a decision. Nobel Prize-winning economist Herbert Simon argued that we lack the information, time, and mental engine to determine the single best path when faced with a slew of options. Instead, we rely on a heuristic to help us stop searching when we find something that’s good enough. Simon called this satisficing. If you think that’s hard, it’s even hard to stop doing something we’re already doing. Yet when it comes to our key investments of time, money, and energy we have to know when to pull the plug. Sometimes we pursue goals at all costs and ignore our self-imposed stopping rule. This goal induced blindness can be deadly. A cross-continental team of researchers matched 145 Chicagoans with demographically similar Parisians. Both the Chicagoans and Parisians used stopping rules to decide when to finish eating, but the rules themselves were very different. The Parisians employed rules like “Stop eating when I start feeling full,” linking their decision to internal cues about satiation. The Chicagoans, in contrast, were more likely to follow rules linked to external factors, such as “Stop eating when I run out of a beverage,” or “Stop eating when the TV show I’m watching is over.” Stopping rules that rely on internal cues— like when the food stops tasting good or you feel full— decrease the odds that people eat more than their body needs or even wants. Stopping rules are particularly critical in situations when people tend to double down on a losing hand. Process rules, in contrast to boundary rules, focus on how to do things better. Process rules work because they steer a middle path between the chaos of too few rules that can result in confusion and mistakes, and the rigidity of so many rules that there is little ability to adapt to the unexpected or take advantage of new opportunities. Simply put, process rules are useful whenever flexibility trumps consistency. The most widely used process rule is the how-to rule. How-to rules guide the basics of executing tasks, from playing golf to designing new products. The other process rules, coordination and timing, are special cases of how-to rules that apply in particular situations. Coordination rules center on getting something done when multiple actors— people, organizations, or nations— have to work together. These rules orchestrate the behaviors of, for example, schooling fish, Zipcar members, and content contributors at Wikipedia. In contrast, timing rules center on getting things done in situations where temporal factors such as rhythms, sequences, and deadlines are relevant. These rules set the timing of, for example, when to get up every day and when dragonflies migrate. While I was skeptical, the book is well worth reading. I suggest you check it out.